Tip 1: “Zombie” deer meat? A recent Chow Line column answers a question on chronic wasting disease, which has also been called “zombie deer disease.” This disease rots the brains of deer, elk, and moose, causing them to act lethargic and less afraid of humans before dying, according to the Centers for Disease Control and Prevention. As such, the CDC advises people to take certain precautions when dealing with deer or elk and the meat from those animals in areas where chronic wasting disease is confirmed within the wild herd. 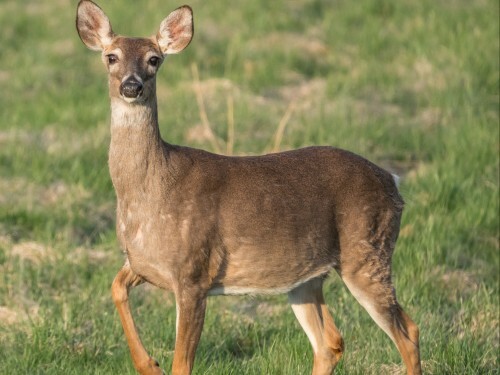 While Ohio’s current status designation is “chronic wasting disease-free in the wild,” there have been some reported cases in three surrounding states: Michigan, West Virginia, and Pennsylvania, the CDC said. The disease has been detected in 24 states thus far, the CDC said. Gabriel Karns, a visiting assistant professor of wildlife ecology and management in CFAES’ School of Environment and Natural Resources, says at this point, Ohioans should not hesitate to eat venison from wild white-tailed deer, noting that “while more cautious culinary approaches, such as not cooking deer bone-in roasts from the neck region with spinal cord intact, may eventually become a standard precaution, the fact remains that current evidence does not suggest that chronic wasting disease affects human health.” Karns can be reached at karns.36@osu.edu or 614-292-3865. Tip 2: Blood test for pain. For the first time, researchers have evidence that fibromyalgia can be reliably detected in blood samples—work they hope will pave the way for a simple, fast diagnosis. In a study that appears in the Journal of Biological Chemistry, researchers from The Ohio State University report success in identifying biomarkers of fibromyalgia and differentiating it from a handful of other related diseases. The study is by lead researcher Kevin Hackshaw, MD, an associate professor in Ohio State’s College of Medicine and a rheumatologist at the university’s Wexner Medical Center, and co-author Luis Rodriguez-Saona, an expert in the advanced testing method used in the study and a professor of food science and technology at Ohio State’s College of Food, Agricultural, and Environmental Sciences (CFAES). Read more about their work in a March 22 story on the CFAES Stories website, “Experimental blood test accurately spots fibromyalgia.” Dr. Hackshaw can be reached at hackshaw.1@osu.eduor 614-293-5813. Rodriguez-Saona can be reached at rodriguez-saona.1@osu.eduor 614-292-3339. 29 Produce Safety Alliance Grower Training Course, OSU South Centers, 1864 Shyille Road, Piketon, Ohio. Registration: $10. Details: Contact Charissa Gardner, gardner.1148@osu.edu, 740-289-2071, ext. 132. 30 Ohio River Valley Woodland and Wildlife Workshop,8:30 a.m. to 3 p.m., Clifty Falls State Park, 1650 Clifty Hollow Road, Madison, Indiana. Educational sessions about forestry and wildlife aimed at helping landowners get the most out of their property. Registration: $55; includes lunch. Preregistration is required. Details: go.osu.edu/Cqyx. 4 Produce Safety Alliance Training,9 a.m. to 5 p.m., Wayne County Administration Building, 428 W. Liberty St., Suite 12, Wooster, Ohio. Designed to meet the Produce Safety Rule training requirement of the Food Safety Modernization Act (FSMA). Free for Ohio residents; $85 for out-of-state residents. Details:614-600-4272, go.osu.edu/Cqyz. 6 The Clover 5K Run/Walk, 7-9:15 a.m., Franklin County Fairgrounds, 5035 Northwest Parkway, Hilliard, Ohio. The Clover 5K is an event for everyone. Registration: $30 by April 5. Proceeds help support Walk & Serve, a Central Ohio community service event that benefits local nonprofits and the populations they serve. Details: go.osu.edu/Cr8N. 11 Produce Safety Alliance (PSA) Training,9 a.m. to 5 p.m., Jackson Township Community Building, 10613 Mahoning Ave., North Jackson, Ohio. Designed to meet the Produce Safety Rule training requirement of the Food Safety Modernization Act (FSMA). Free for Ohio residents; $85 for out-of-state residents. Details: go.osu.edu/CqzD. 13 Buckeye Bonanza Horse Sale and Open House, 10 a.m. to 3 p.m., Ohio State Equine Center at Don Scott Field, 3658 Kays Road, Dublin, Ohio. Ohio State students will be on hand to answer questions and demonstrate their equine skills. A petting zoo, wagon rides, and other fun activities will be offered for the whole family.Details:go.osu.edu/CsqQ. 18 Russell Klein Memorial Nutrition Research Symposium, 8 a.m. to 5 p.m.,Nationwide and Ohio Farm Bureau 4-H Center, 2201 Fred Taylor Drive, Columbus, Ohio. Three guest speakers from the Cleveland Clinic, University of Arizona, and University of California-San Francisco. Registration deadline: April 5. Details: go.osu.edu/Cr8b. 1 Leadership Institute: Effective Coaching and Emotional Intelligence,9 a.m. to 2:30 p.m., Nationwide and Ohio Farm Bureau 4-H Center, 2201 Fred Taylor Drive, Columbus, Ohio. Registration: $415 for the general public, $395 for OSU employees. Details: go.osu.edu/Cr8d. 8 Tree Walk,1–2 p.m., Seaman Orientation Plaza, Secrest Arboretum, OARDC, CFAES Wooster Campus, 1680 Madison Ave., Wooster, Ohio. Features a range of tree-related topics including selection, planting, pests, and diseases. Free, no reservations required. Details: 330-263-3761. 16 Private Pesticide Applicator Testing,testing begins at 10 a.m., Portage County Office of OSU Extension, 706 Oakwood St., Room 101, Ravenna, Ohio. Details: go.osu.edu/Cr8z. 18 Simply Nature for Families,10:30-11:30 a.m., Secrest Welcome Center, OARDC, CFAES Wooster Campus, 1680 Madison Ave., Wooster, Ohio. Children will be led through several outdoor activities and receive a take-home kit to connect the park experience with backyard nature. Activities are free, but please call 330-263-3968 by May 15 to register. Intended audience is children ages 5–10, accompanied by parents, grandparents, or other caregivers. Details: go.osu.edu/Cr8v. 22 New Pesticide Applicator Training, 8:30 a.m. to 3:30 p.m.,Ohio Department of Agriculture, 8995 E. Main St., Reynoldsburg, Ohio. Cost: $35 morning session, $30 afternoon sessions. Preregistration encouraged; on-site registration by cash or check only. Details: go.osu.edu/Csqn. 22 Herbs and Perennials Workshop,9:30 a.m. to 3 p.m., Miller Pavilion, Secrest Arboretum, OARDC, CFAES Wooster Campus, 1680 Madison Ave., Wooster, Ohio. Cost: $40 arboretum members, $45 non-members. Details and to register: go.osu.edu/Cr85.Contact: Paul Snyder, snyder.1062@osu.edu, 330-263-3761.